The device aims to make the treatment of skin cancer more comfortable. A sticking plaster approach to treating skin cancer has been unveiled at Ninewells Hospital in Dundee. 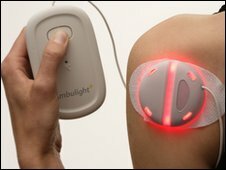 The light-emitting Ambulight PDT device has been developed in an attempt to make the treatment of skin cancer faster and more comfortable. Clinicians said the plaster avoided scarring and reduced the amount of time patients need to spend in hospital. Skin cancer is one of the most common cancers in the UK, with its incidence doubling every eight to ten years. The new treatment, which is being rolled out to hospitals across the UK, would see skin cancer patients given a drug which makes the affected skin sensitive to light. The disposable light-emitting plaster is then stuck over the top, allowing photodynamic therapy treatment (PDT) to be applied directly to the skin, destroying the cancerous cells. For non-melanoma, the most common treatment in the past has involved applying a cream to the skin for several hours before the patient undergoes intensive light treatment. But with the new device, the patient can be in and out of hospital within minutes, enabling them to continue with their normal daily routine while undergoing PDT treatment. Pilot clinical trials have also indicated this new treatment method causes lower pain than conventional techniques while still achieving an equivalent outcome. James Ferguson, a professor of dermatology at Ninewells, explained: "This new device can be taken away home with the patients. "It is escaping from the hospital environment, making for a gentler approach to skin cancer treatment." Muriel Lowe, one of the 50 patients who have so far been treated in Dundee, said: "I came in not knowing anything about the treatment. "The nurse and the doctor explained the process really well, the plaster device was put on and I went home. "There was a nippy feeling but the pain threshold from nought to ten was only about a three and I have been told that the conventional method was about an eight."